5 Future Developments that will revolutionize Online Hotel Marketing: “For tomorrow belongs to the people who prepare for it today”, says a famous proverb…and what better fit to apply this than in the world of technology and marketing? The breakneck speed of tech evolution is inspiring (and often scary) but the two keywords that will set winning developments apart from the ‘also ran’ are ‘love’ and ‘simplicity’. It doesn’t take a degree to understand that people adopt technologies that fuel their imagination & passions…and the rate of adoption is in close sync to the simplicity of its interface and operation. Great technology needs to adapt to the needs of the user and future breakthroughs will bear testament to this. Some of the above may sound like science-fiction, but interestingly enough, many of the underlying technologies for these developments are already under fabrication or refinement. In many respects…the future is already here. For hoteliers who worry about keeping ahead of the curve and catching up with tech developments, there’s good news. Great technology will always simplify rather than complicate our lives…and in the end, all the above developments will only empower consumers and offer a clearer picture of the world. Those who build great hotels and offer exceptional service will still come out on top…the technology will simply fade into the background and accentuate your success. I wonder if rankings deserve to be number two most important thing, i see a lot of hotel (particulaly those privately owned) fall flat with SEO campaigns. i guess i would heed the warning that a lot of hotels dont know how to market online, so the ranking is not as important as the knowlege of how to get it. 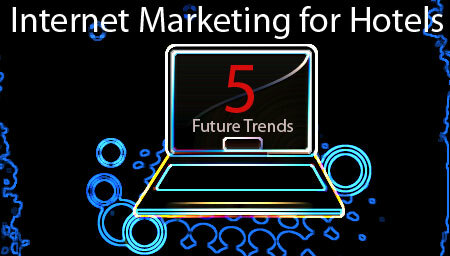 Pingback: Hotelemarketer » Hotel Internet Marketing by 2013 – Are we on Track? This blog is very intriguing to me because I like to see options the industry has for the future. I think the lodging industry definitely does a well job marketing their hotels on the internet but there is always room for improvement. That is why I chose this article because I like that the industry acknowledges that there is always new technology and in order to keep up with the modern technology they need to have a newer system for the public to enjoy. The information is also useful for hotel managers that are interested in expanding their ways of marketing. I think this blog is the great examples of how we can use internet for promoting our business. I like to congratulate to author for writing such useful and interesting blog. Thanks for sharing this information with me.